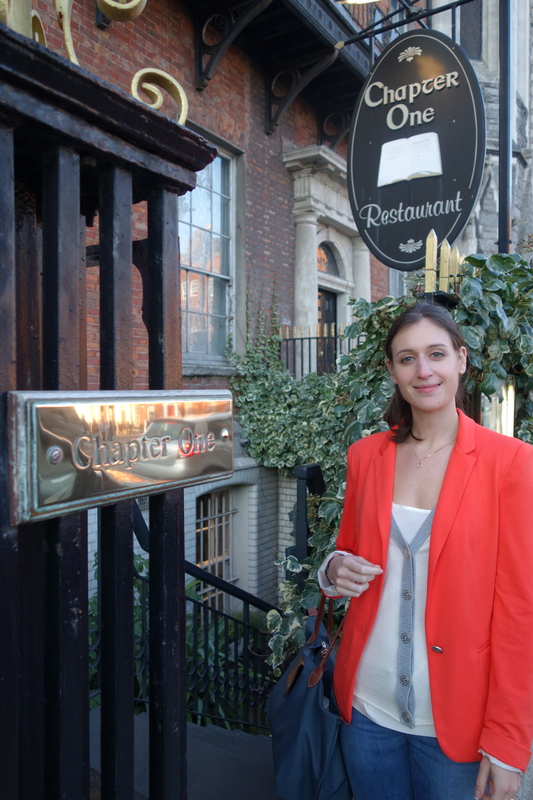 We had heard great things about the Pre-theatre menu at Chapter One after J’s parents went there while visiting us. It is also a bit of a Dublin institution and my brother had kindly given us a gift voucher for Christmas (Thanks P! 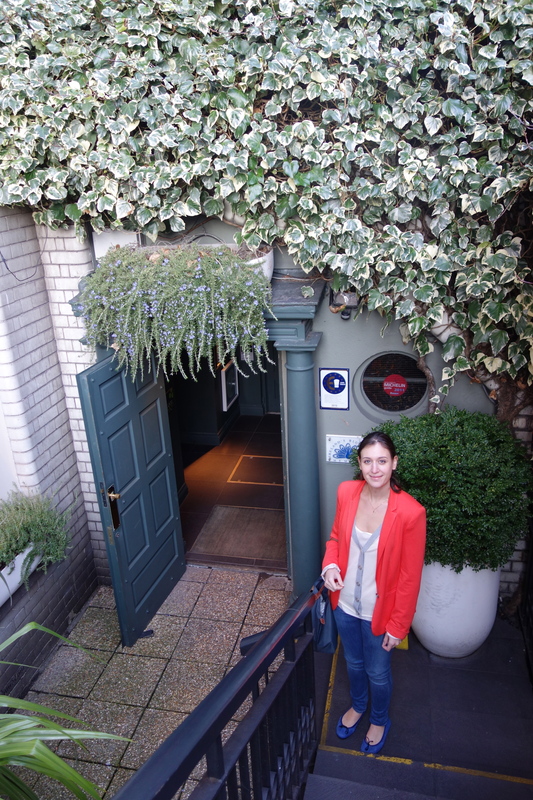 ), so I was very excited to get the opportunity to check it out. I was worried that because it was in the basement it would feel a bit dark and dingy but it ended up being my favourite restaurant dining space to date. The chairs were so comfortable and there was a lot of space between tables. It wasn’t dark or dingy and it had a very neutral and modern feel to it, however the floor manager couldn’t seem to decide on what lighting he preferred and kept adjusting the dimmer switch which was a little annoying! One of the best things about this pre-theatre menu (we were not actually going to the theatre afterwards but most people were and they collect your tickets for you) was the choice you get. 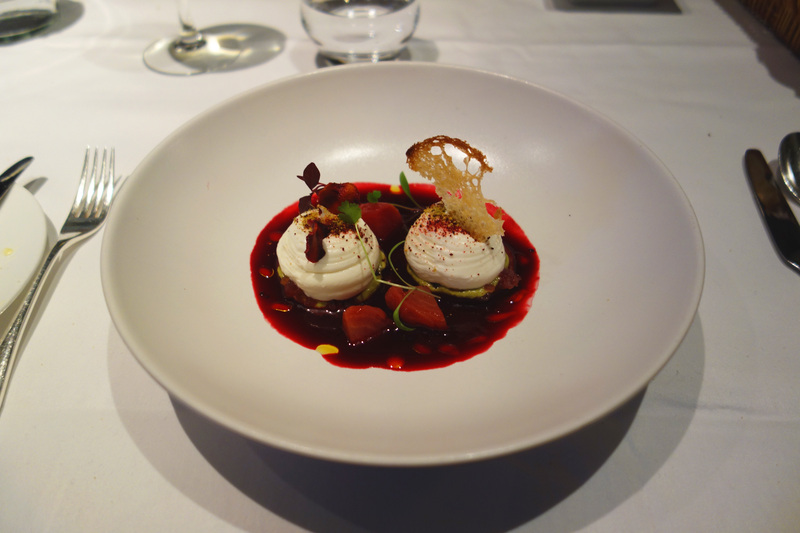 We had a choice of four dishes per course and it is amazing value for money at just €36.50 for 3 courses. 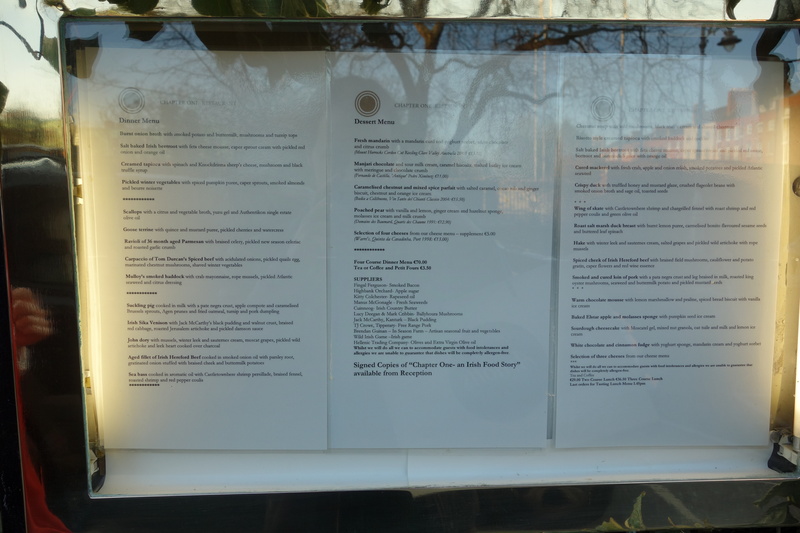 I should mention as well that Chapter One has a michelin star and gives you a full list of their suppliers on the menu. 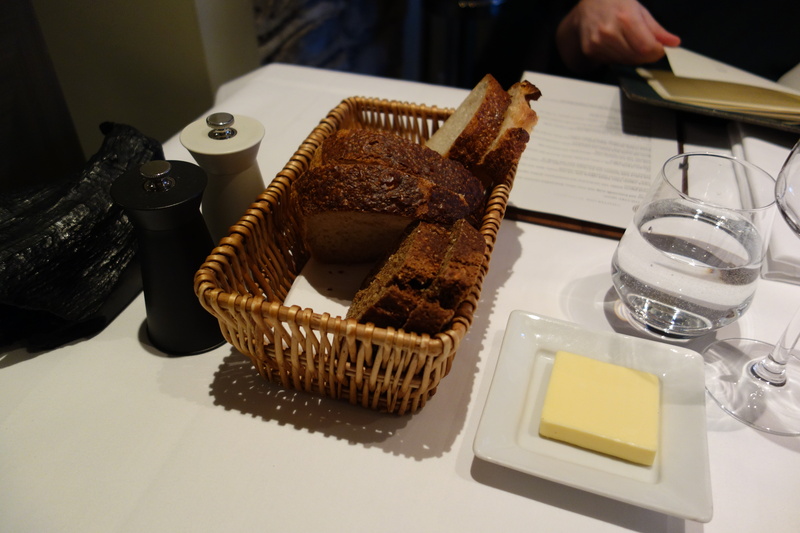 We started with a delicious looking bread basket with a lot of bread for just the two of us. Luckily there was Irish soda bread which J doesn’t like so I got it all to myself! To start, J and I both had the salt baked Irish beetroot with feta cheese mousse, caper sprout cream and pickled red onion, beetroot and horseradish juice with orange oil. The dish displayed wonderful colours but the textures were a bit boring after a few bites and I found myself willing myself on to finish the dish. 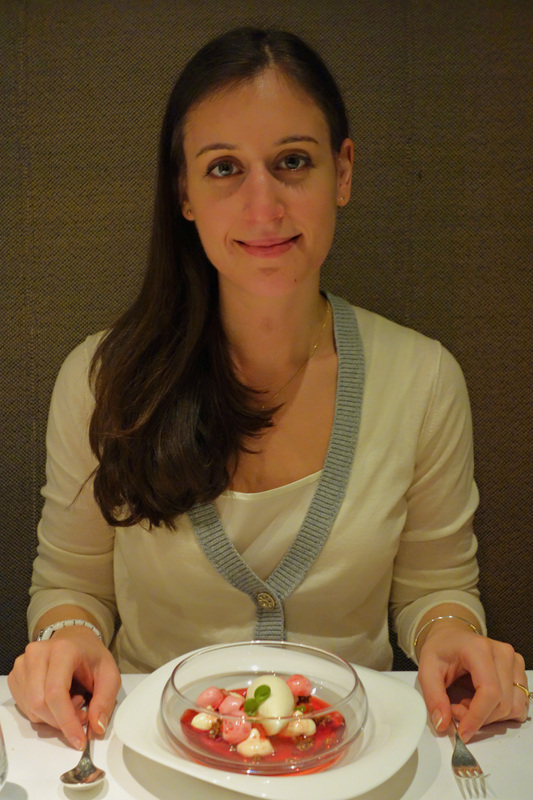 J felt that the orange blossom oil had no place in the dish, but I liked it. I thought that it could have just had one of the feta cheese mousse as it was a very wet dish and you just didn’t need two. 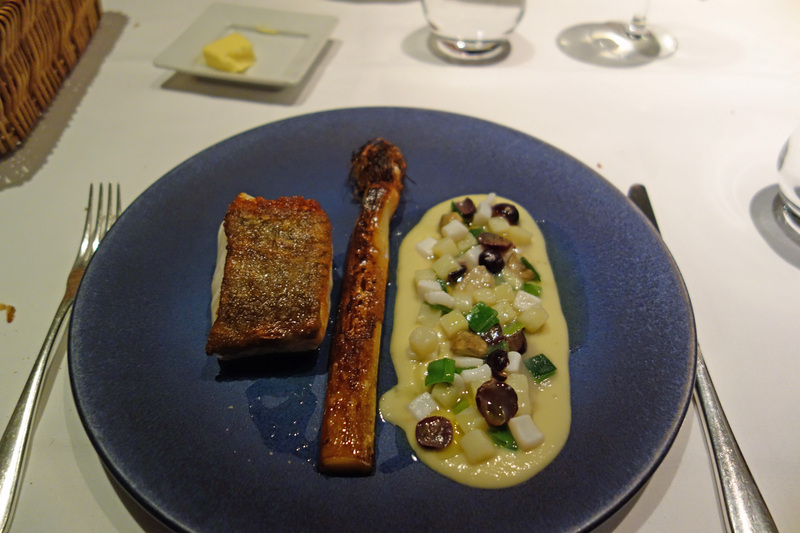 For my main course, I had cod with winter leek and sauternes cream, Muscat grape and marinated wild artichoke, crab and squid dressing. 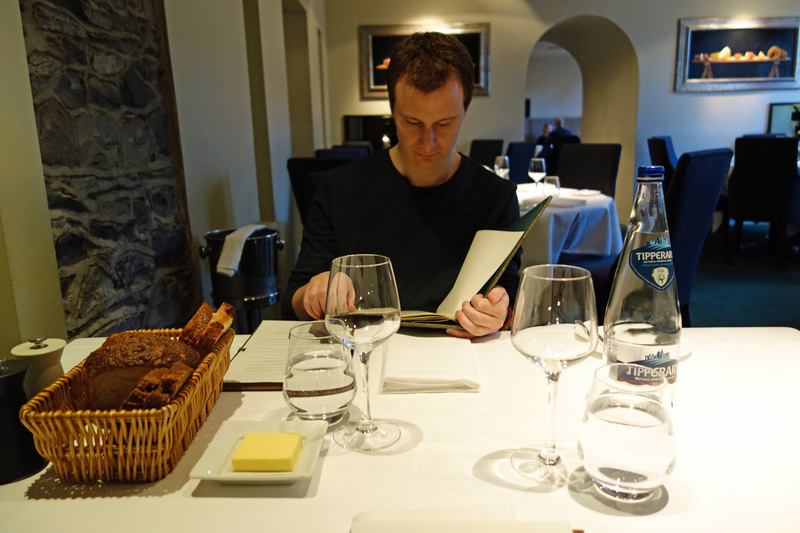 I thought the cod was the best cooked fish I have ever eaten and I’m not a huge cod fan! The skin was amazingly crispy and tasty and the fish was perfectly cooked and soft and delicious! I loved the mix of grape, artichoke, crab and squid, it was exceptional! My only fault with the dish was I didn’t like the leek at all and I didn’t really feel like it belonged on the plate as the flavour didn’t go with the others. 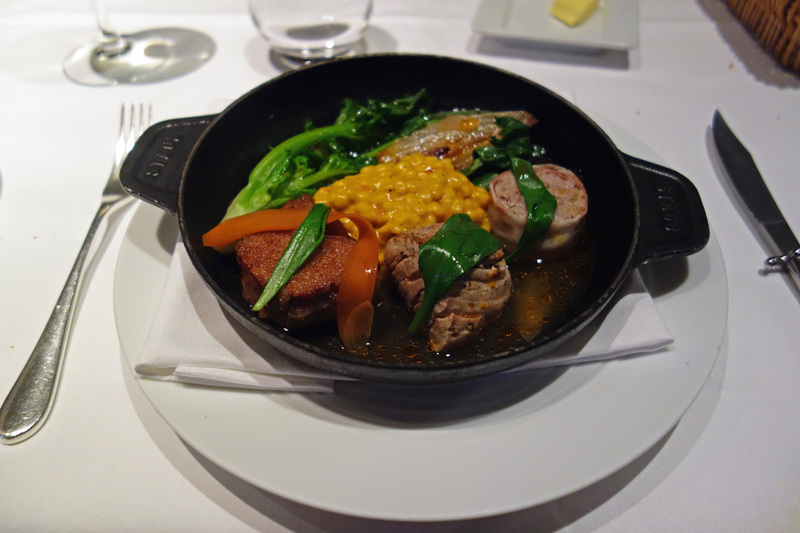 J ordered the hot pot of pork cuts with a carrot and barley risotto, broccoli rabe and pickled garlic with roast shallots. Unfortunaltey, I think they made a mistake with there choice of serving dish for this meal as he found it extremely difficult to cut the various bits of pork in the ceramic bowl and it didn’t really feel right as it wasn’t really a stewy dish. 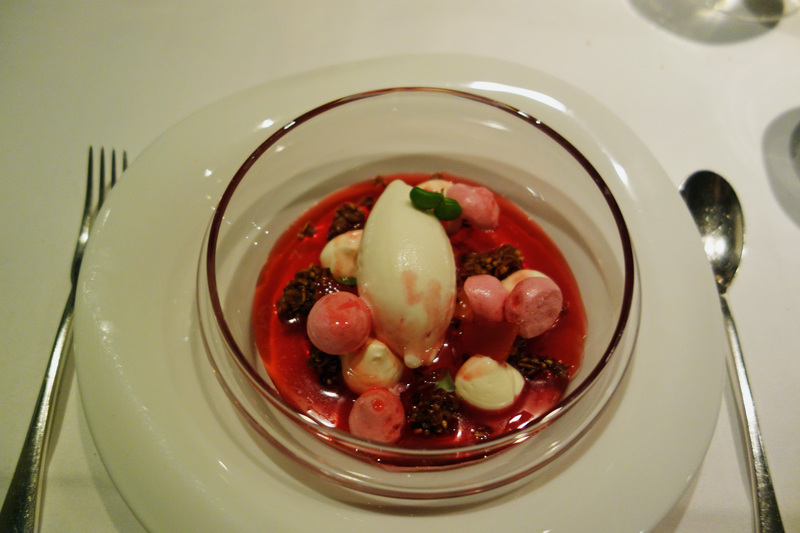 For dessert I had granola with cranberry coulis cream and yoghurt ice cream. It looked beautiful and tasted amazing too, I couldn’t fault it! The granola especially was divine! 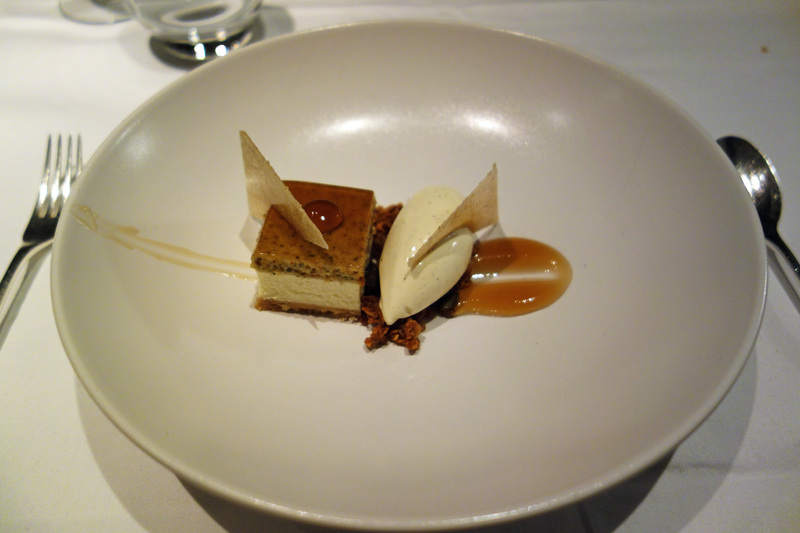 J had the sourdough cheesecake with Moscatel gel, mixed nut granola, oat tuile and milk and lemon ice cream. 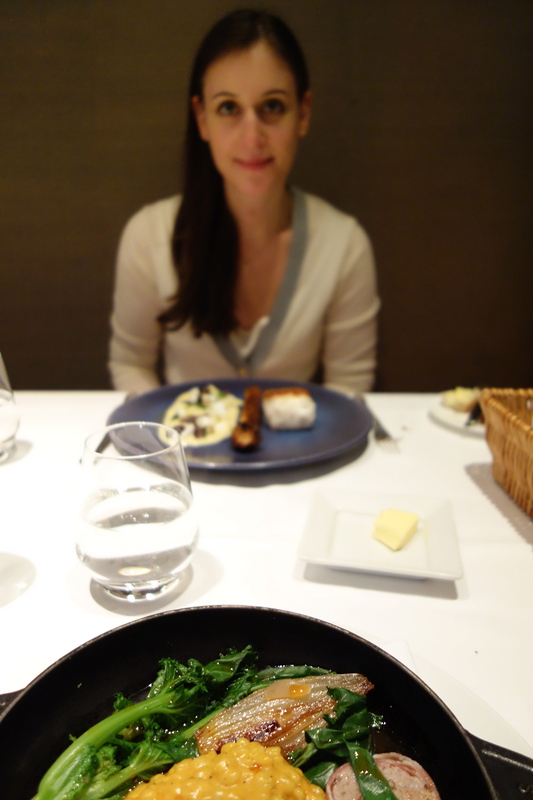 I thought it looked a little boring but J really enjoyed it and it was his favourite course of the meal. I enjoyed the whole experience and I would definitely go back, especially for their pre-theatre. 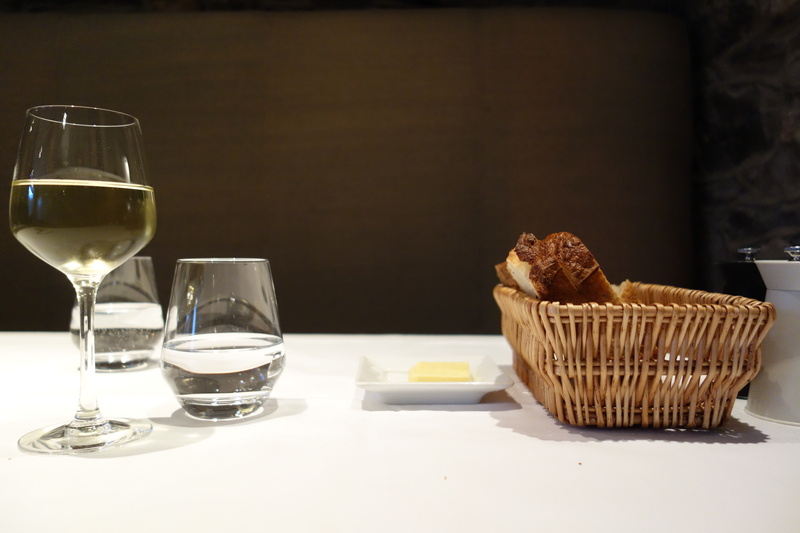 I liked that it felt like a bit of an institution and the food was more on the classic side rather than ultra modern like at The Greenhouse. 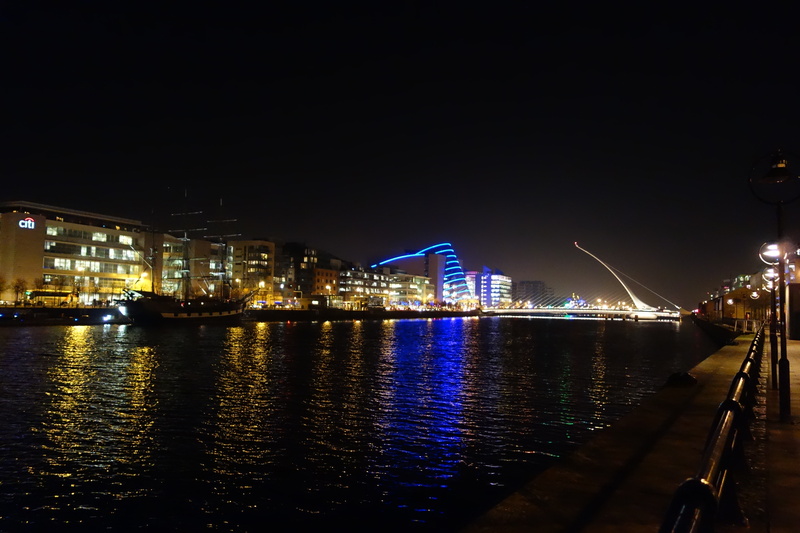 We didn’t stay for coffee as we were very full and instead we decided to walk home and enjoy the gorgeous view along the Liffey River.